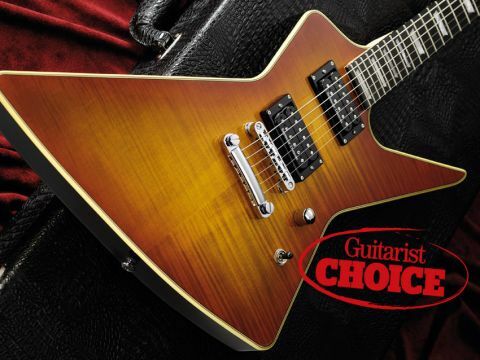 This is a no-nonsense shape guitar that's perfectly suited for all rock styles. It's a signature model you can enjoy, irrespective of your devotion to Motörhead. Great tonal performance. Looks. Price. This signature guitar is much lighter than many Explorers we've played. The jack socket's location prevents things getting in the way when you're playing sitting down. Pretty it ain't, but the sculpted heel makes top-fret access more comfortable. Welshman Phil Campbell is by far the longest-serving Motörhead axeman of them all, having joined way back in 1984 as part of a short-lived two guitar line-up with Michael 'Würzel' Burston. Over the years his gear needs have been served by the usual suspects - Fender, Gibson and, in more recent history, Parker - but for the latest portion of his career he's used Lag guitars. Interestingly, this production version of his Gibson Explorer style electric isn't his first Lag signature - that was the now discontinued Arkane Mastershop Phil Campbell Model - and the spec of this brand new S1000PC-HOS is very close to that of his personal 'Number One' instrument. The inspiration behind the shape of the guitar is obvious enough, however the body itself, not to mention the associated vibe, is slightly removed from that of Gibson's mighty Explorer when examined more closely. Both cutaways are slightly elongated in comparison and the various points are sharper. As a result, it's actually closer to the style of more modern designs such as the Dean Z, Hamer Standard and Ibanez Destroyer. Even though Motörhead's music is considered among the most brutal ever recorded, Campbell's guitar tone leans more towards the classic rock sphere than an out-and-out aural assault and it's no surprise that the body is fashioned from two centre-joined chunks of mahogany. It's topped with a bound veneer of flamed maple that's finished in honey shadow, the solitary hue on offer. The top's visual depth and shimmer is impressive and the dusky colour is, as its name suggests, a smokier version of Gibson's honeyburst - very pretty indeed. Pickups comprise the classic Seymour Duncan combination of a bridge JB - the Trembucker version is used here, even though the guitar is a hardtail - and an SH-1 '59 at the neck; controls are stripped down to include just a single volume pot alongside a standard three-way toggle pickup selector. One departure is the position and design of the jack socket: it's a black recessed Strat-style affair sited on the guitar's lower edge just beneath the volume control. When playing the guitar standing up it allows you to neatly and securely tuck your lead behind your strap and, best of all, its location also means that the jack plug doesn't get in the way to any degree if you're playing sitting down. There are no surprises as far as the construction of the neck is concerned. It's a two-piece hard rock maple construction that sports a 24-fret ebony fingerboard resplendent with Gibson-style trapezoid mother-of-pearl inlays, and the flamed maple veneer of the small headstock is colour-matched with the body. The heel has been thoughtfully shaped on one side to aid fret access and, strapped on, the guitar is nicely balanced and pleasantly lightweight to cavort with. Our example has its action set with sufficient height to provide more than enough room to adequately articulate power chords and, although it has a fairly thin-depth feel, the unfinished maple fills the hand agreeably. It's not often we focus first on a description of the neck pickup, but the '59 fitted here gives what we'd describe as the perfect performance for rock-based scenarios that need such a selection. There's plenty of push, but what makes the Lag unusually good here is that there's also a cutting edge to the tone that allows any Slash-style solos to really jump to the front of a band's mix. The string separation is so good that we were happy to use it for ultra-dense power chords too, although we would concede that the clarity of sound is powerfully assisted by adding extra amp gain. The Trembucker-spaced TB-4 in the bridge gives a slightly wider bobbin - by just over 2mm - than the standard JB that results in a larger magnetic field within which the strings can work their magic, and the guitar sounds absolutely huge almost irrespective of the amounts of gain you use. With a Tube Screamer'd Marshall 2245 head on deck, classic rock tones are fat and vibrant, while a cascading high-gain setting allows the guitar to really soar with heightened levels of clarity and aggression. The added harmonics give solos a thoroughly modern edge, while the mahogany ensures that no depth is lost. In short, if you love the sound of an Explorer, this Lag is a perfectly credible modern option that's also lighter to lug about and looks extremely smart to boot. This is a rock guitar that sounds wonderful, looks beautiful [Beauty, beholder etc - Ed] and weighs much less than many Explorers we've played. And unlike a number of other signature models, there's little here to denote Phil Campbell's allegiance other than a small signature on the headstock.